You’ve focused all your time and energy on working damn hard and achieving your dream career. So, what now? It’s the age-old question - can working women really have it all? We say yes. We’re firm believers that you don’t have to sacrifice your love life in order to find fulfillment in the workplace - or vice versa. After a long day in the office, it’s hard to muster the energy to spend your free time on dates that may well turn out to be duds. But the nature of dating dictates that everyone has to kiss more than a few frogs to find their prince charming. So be sure to find the time for dating - even if it’s just one drink after work. If nothing else think of it as a way to unwind with a whiskey and some new conversation. Online dating can be something close to a godsend for the career woman looking for love - as long as you know how to get the most out of it. Start by heading to a dating site which saves you time by doing the matching for you. Zoosk's Behavioral Matchmaking gets to know your likes and dislikes and matches you accordingly, essentially saving you from a lot of unimpressive profiles. Look for someone who understands and appreciates your own personal career goals. Sit down and discuss your 5-year goal and ensure your partner is on the same page. Talk about your own aspirations and hopes for your career. If you make your partner a part of the journey, they’ll be more likely to jump on board. Try a dating site like Elite Singles, which is aimed at university grads and professionals who don’t have a ton of time to invest on dating sites. Singles are matched based on their answers to a personality questionnaire, essentially cutting through the crowd and matching you with singles you’re more likely to mesh with. Because when you filter from the outset it’s a lot easier to find what you’re looking for. When you have a stressful deadline or are going through a particularly gruelling work week it’s tough to be present and focus on the person in front of you. Learning to compartmentalize and shut off your hyper rational work brain and turn on your emotionally charged love brain is key to finding that work/life balance. Relationships take work, but if you feel like your partner is not considerate of your career goals it might just be time to call it a day. As the saying goes; there are many more fish in the sea (or lots more dating sites, so on to the next!). You wouldn’t settle in work, so don’t settle in love either. Some well-known entrepreneurs have admitted drawing up a formal contract to best manage time with their partners. 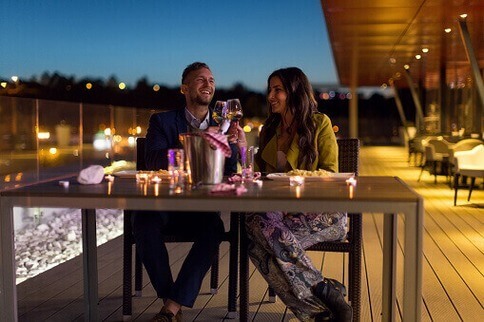 Whether it’s a fixed date once a week, or a weekend away once a month, it’s always good to have time together to reconnect after a busy week and remember why you fell in love! Relationships demand the same level of effort you put into your work. If you worked hard reaching your work goals this month, throw the same effort into your relationship! Take pride in your relationship - success is not just limited to the office.